In spurts of sunshine during our unusual rainy weeks, bees are somersaulting to grab a meal with the grabbing is good. Abutilon palmeri made it to the hit list. I have no luck overwintering this silvery-leaved beauty in the ground, so I’m growing it in a container safely tucked into my patio. 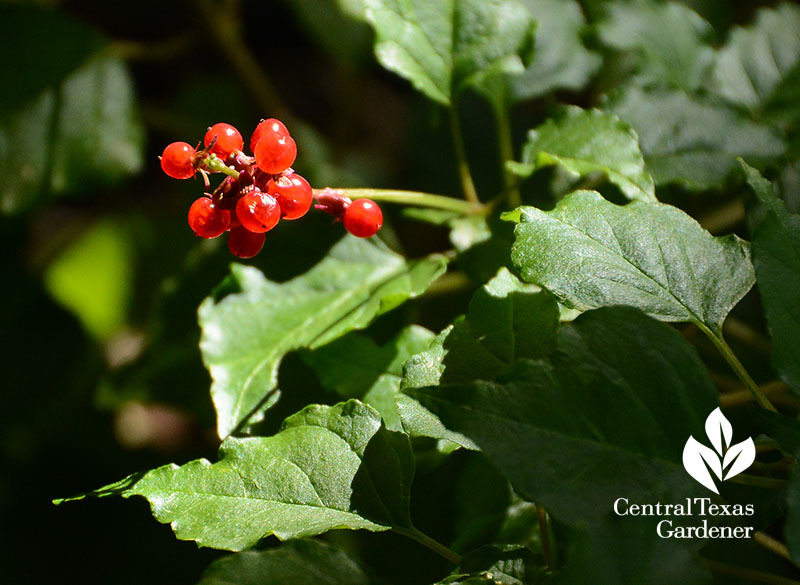 Over in part shade, hungry birds pluck glowing berries atop native pigeonberry. 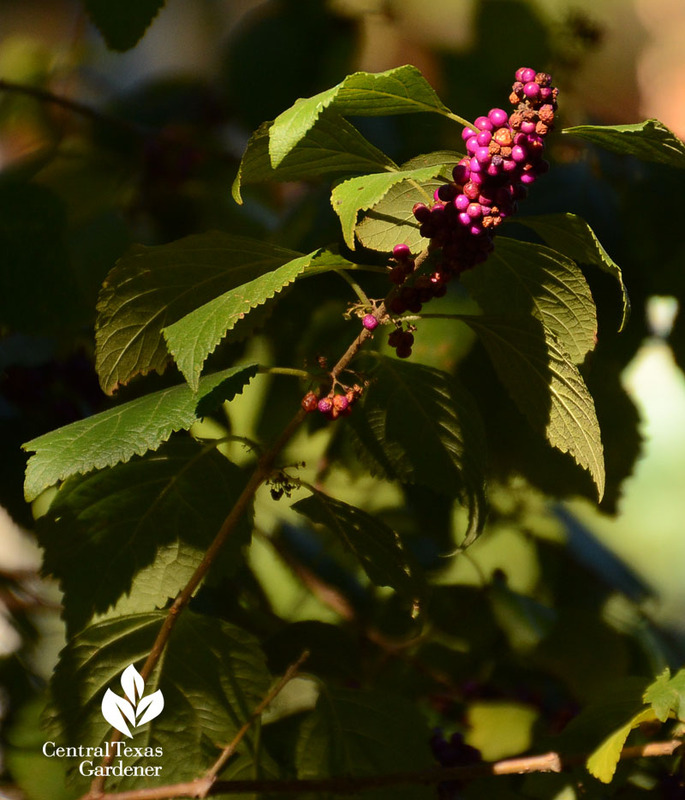 Around town, birds are feasting on American beautyberry’s (Callicarpa americana) purplish fruits. 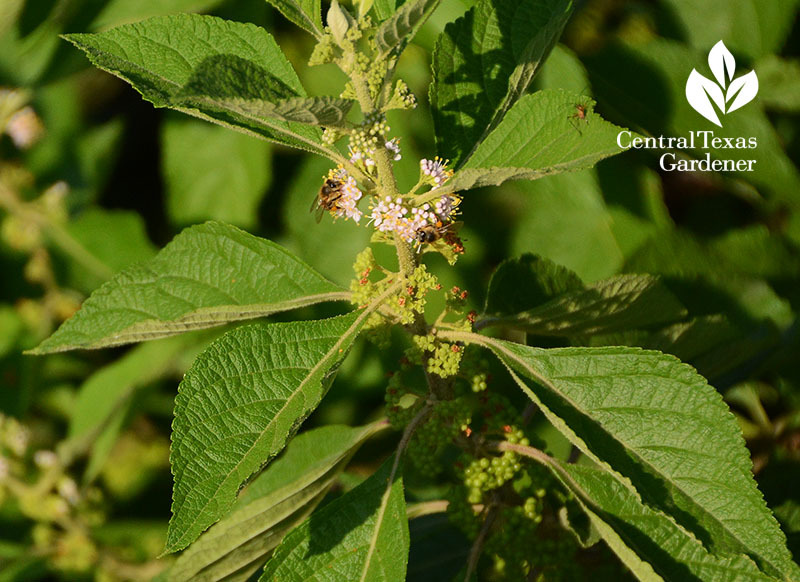 In late spring, its flowers took care of the bees. 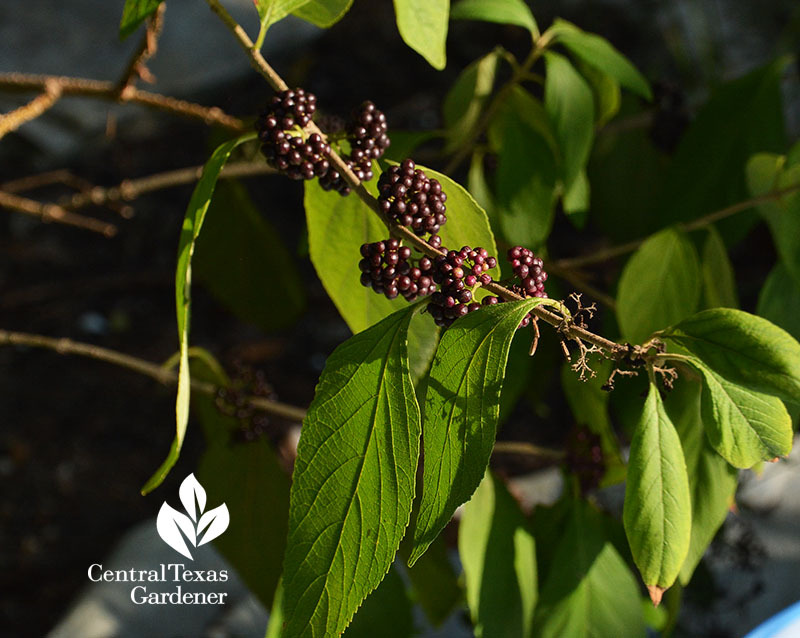 Sadly, mine—and Mexican beautyberry (Callicarpa acuminata)—didn’t flower or fruit this year. My American beautyberry gets too much shade; I will move it this weekend to a brighter shade spot. Oh yeah, this is a great time to move trees! And do keep them watered this winter if deep-soaking rainfall eludes us. Although they both suffered from lengthy drought, I’d moved the Mexican beautyberry and failed to water it enough this summer. Thankfully, it recovered once I corrected that situation with slow, deep watering. I knew better, really I did, but I just didn’t get out there and do it. That’s one reason for CTG: to spare you our mistakes and woes. 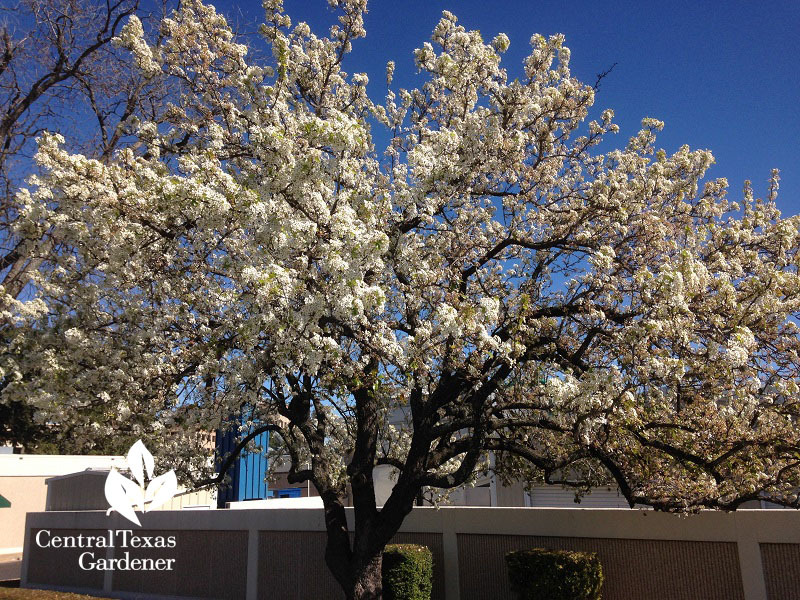 This week, City of Austin Urban Forest Health Coordinator certified arborist April Rose gets new trees off to a good start. 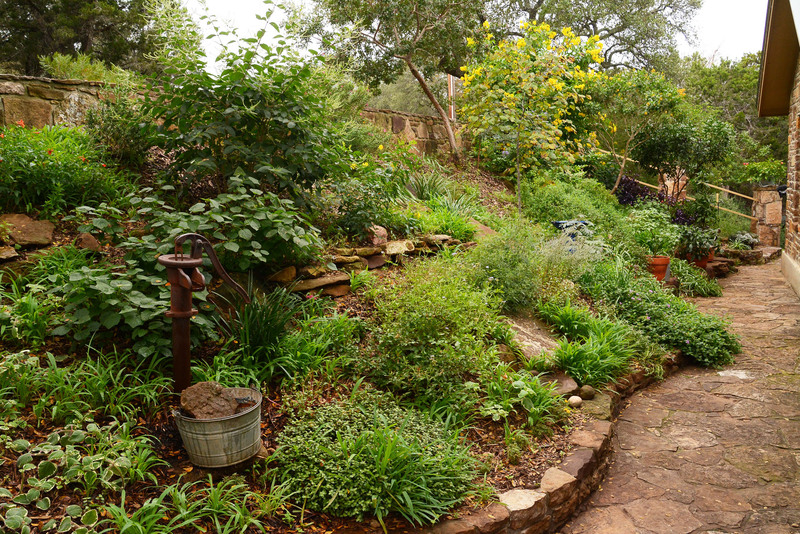 Find out how to plant, why not to add compost or additives when you backfill, and how to CORRECTLY mulch and water. Watch now! 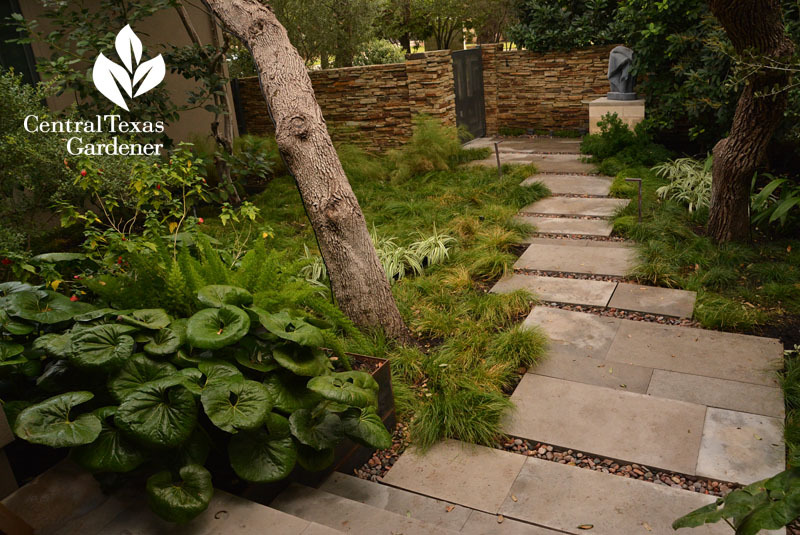 In Texas, we celebrate Arbor Day the first Friday of November, to take advantage of cooler temperatures and ideally, a little rain. 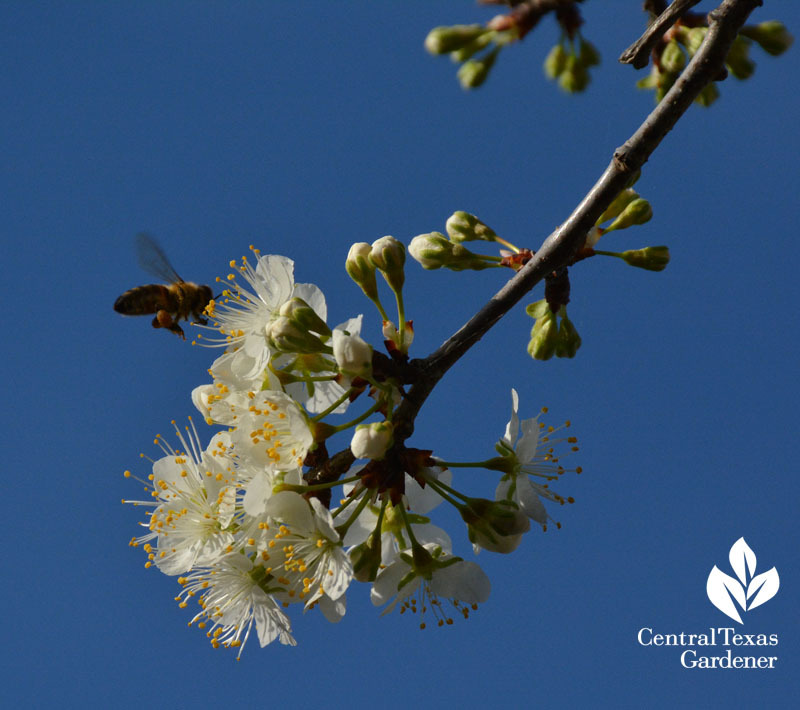 One to add to your small tree list is February-blooming Mexican plum for pollinators. 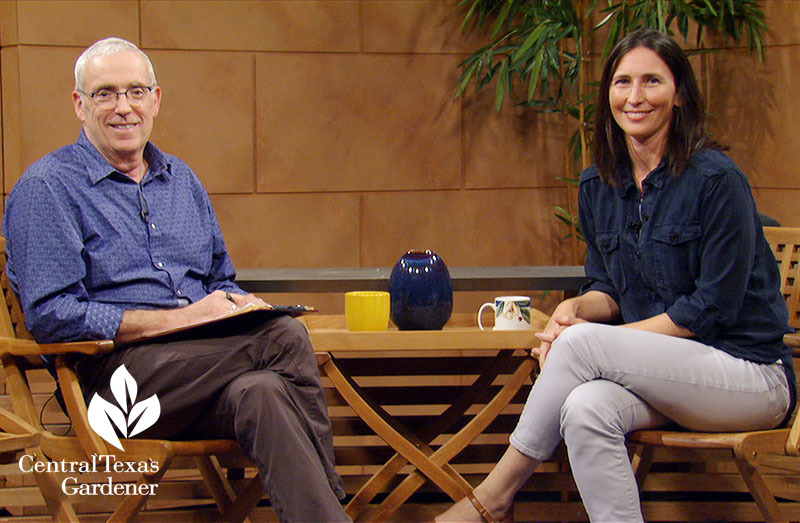 April also takes our Down to Earth segment to answer some of the many tree questions that I’m getting. One is about Gail’s bur oak tree with a huge cavity in its trunk. A hollow spot this large does need inspection by a certified arborist. Here’s one way to find one. 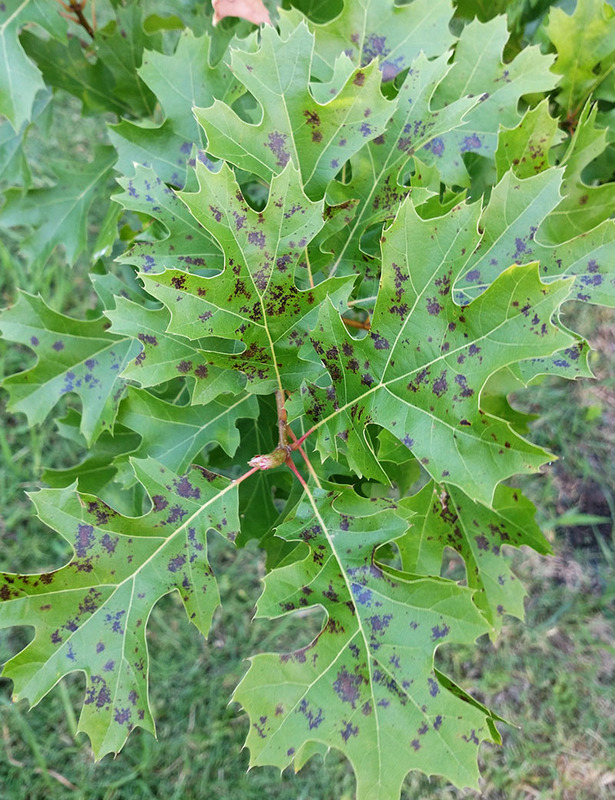 Ray’s tree has spots, as do many trees right now after weeks of hot, humid weather. This is not really a problem, especially since leaves will be dropping soon, but cultivation practices could make a difference. 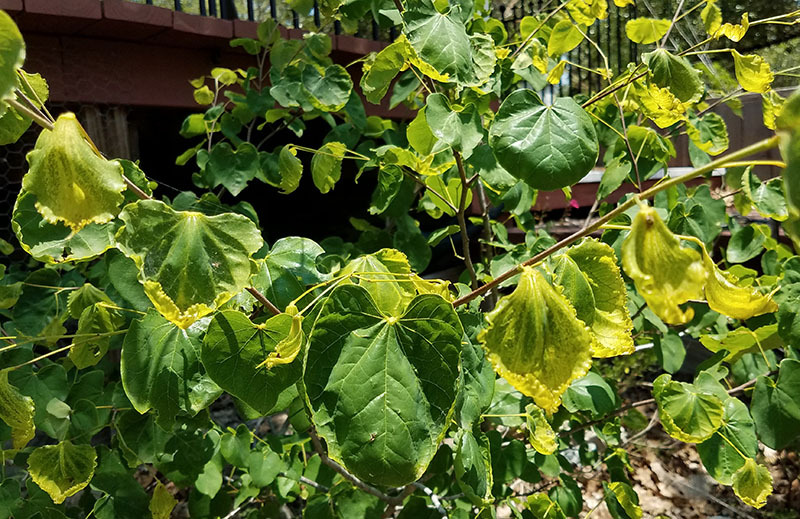 And James’s redbud tree developed distorted leaves, possibly a result of someone using herbicide in the neighborhood, which can volatilize and damage trees and other plants by drifting through the air. 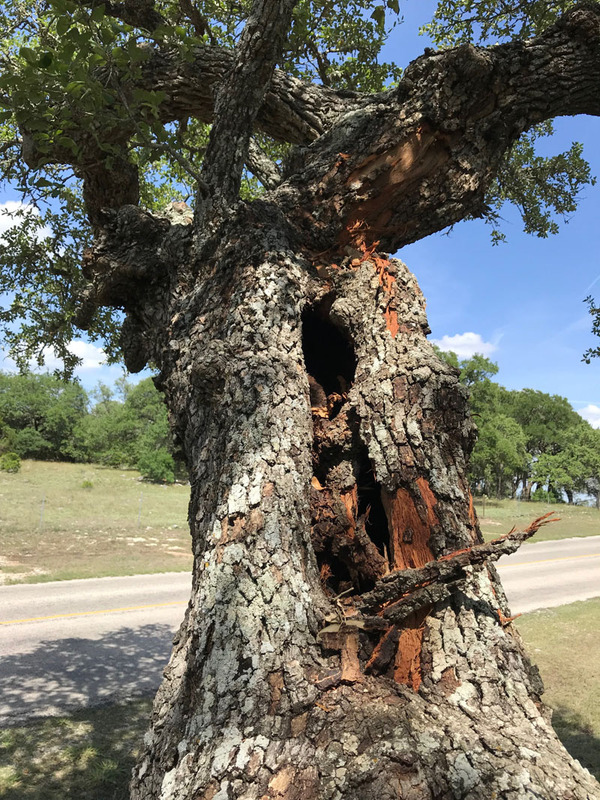 Get April’s complete answers about these troubled trees. 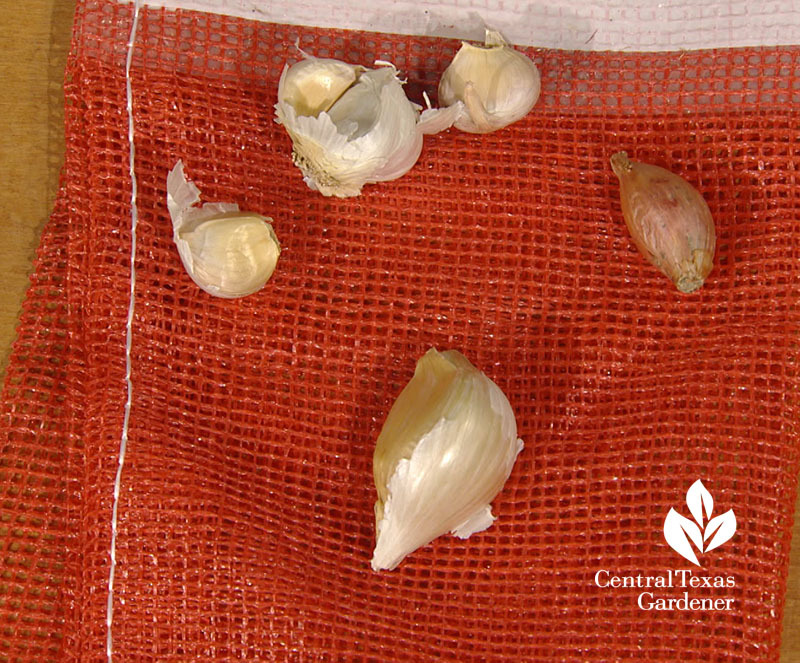 For the kitchen: now’s the time to plant garlic, elephant garlic (a type of leek), and shallots. 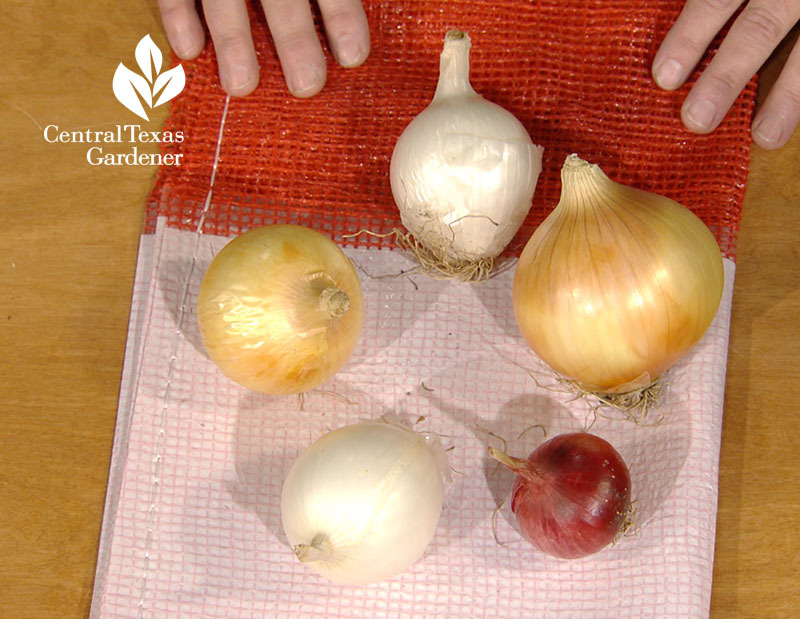 We can also plant onion seeds to mature like these in May. 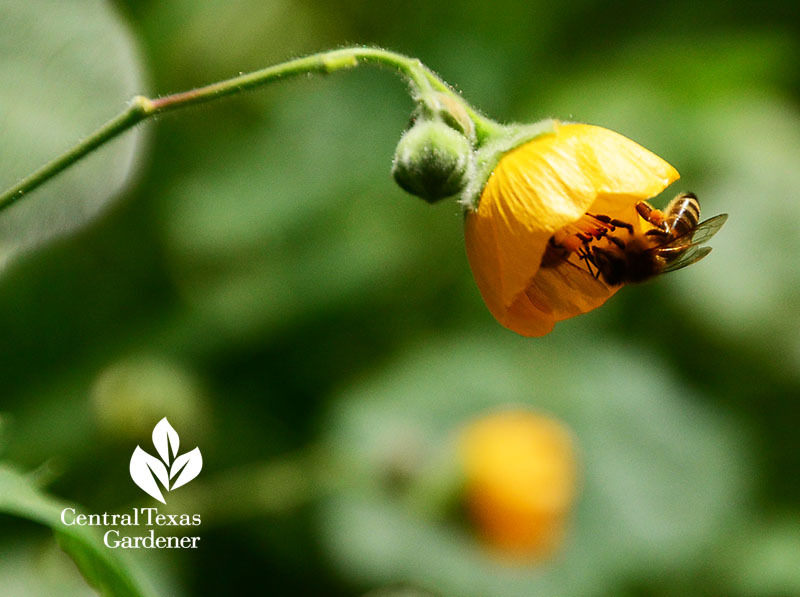 You want short day plants in Central Texas, including Yellow Granex, Texas Early White, Red Creole, and 1015Y Texas Super Sweet (named for planting Oct. 15, but there’s still time!). 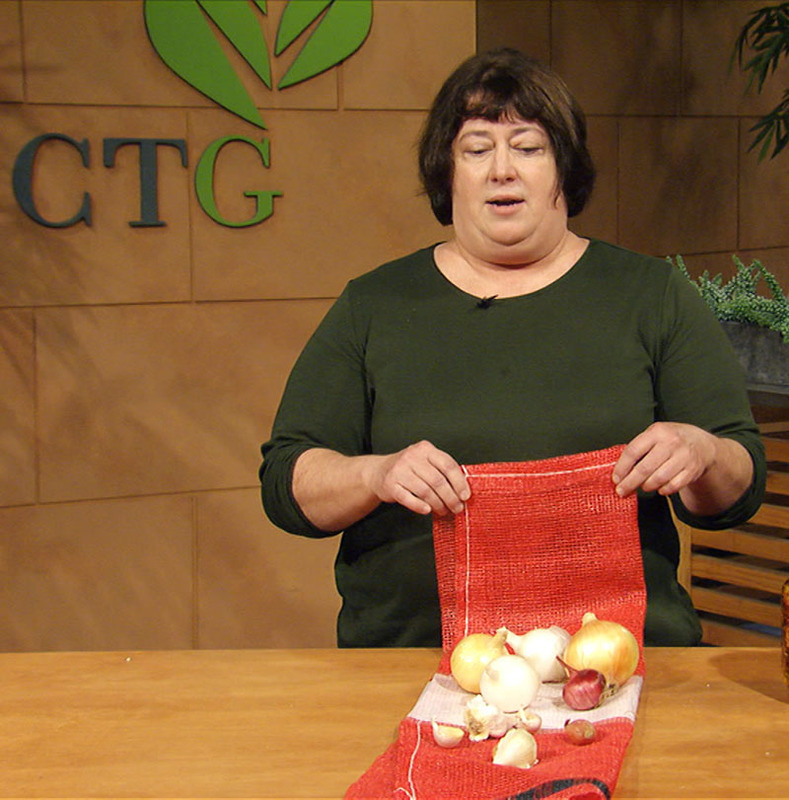 Plant onion sets and transplants in January and February. They’re easy to do, as long as you have well-drained soil and sun. Carla Crownover from Springdale Handmade explains how. She even brought along onions that she harvested last May, still firm and fresh. Carla also chops and freezes her harvests or pulls up earlier to use as “spring onions.” Generally, you harvest all these plants when the leaves brown and fall over in May or so. Watch now! 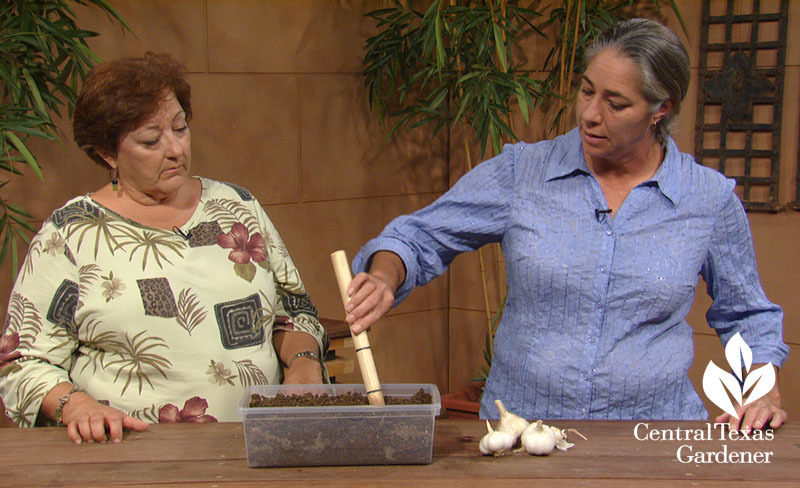 Find out more about planting and harvesting garlic with Trisha Shirey and Ivy Lara. 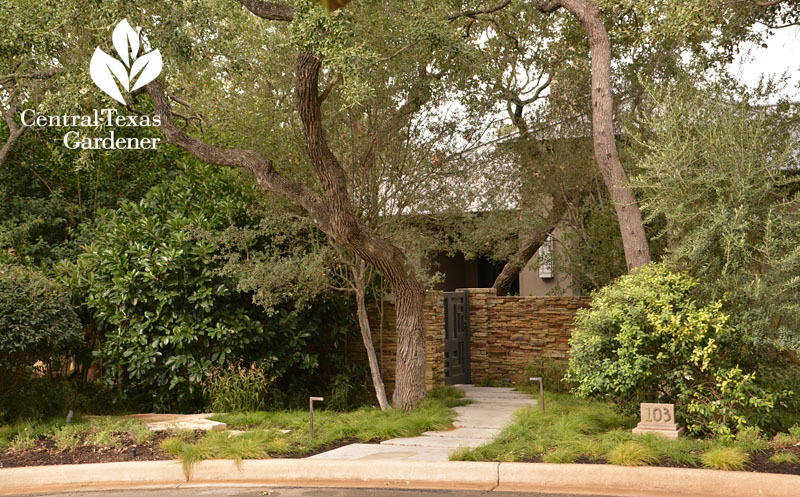 On tour: In San Antonio, Pat and David Mozersky value the shapely live oak trees that overlook their small courtyard gardens and compact, resourceful house. 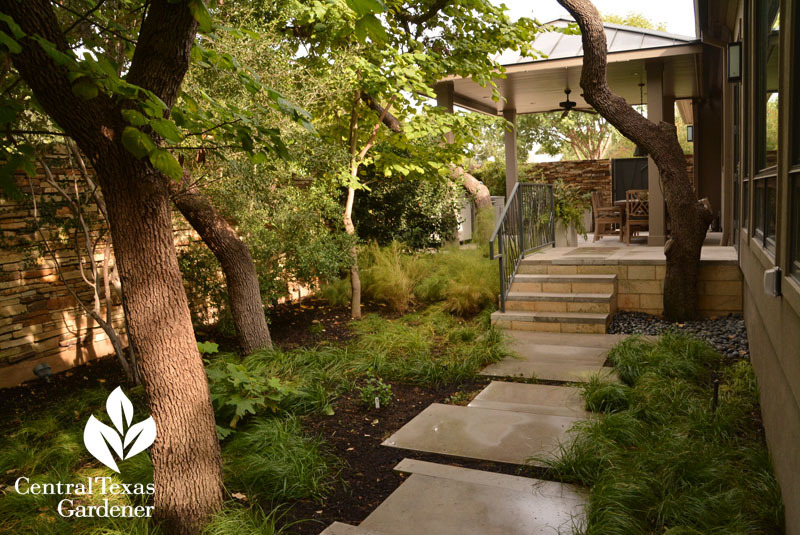 In these shady conditions, they worked with Austin garden designer Mark Word to grow a low-care, water thrifty garden. 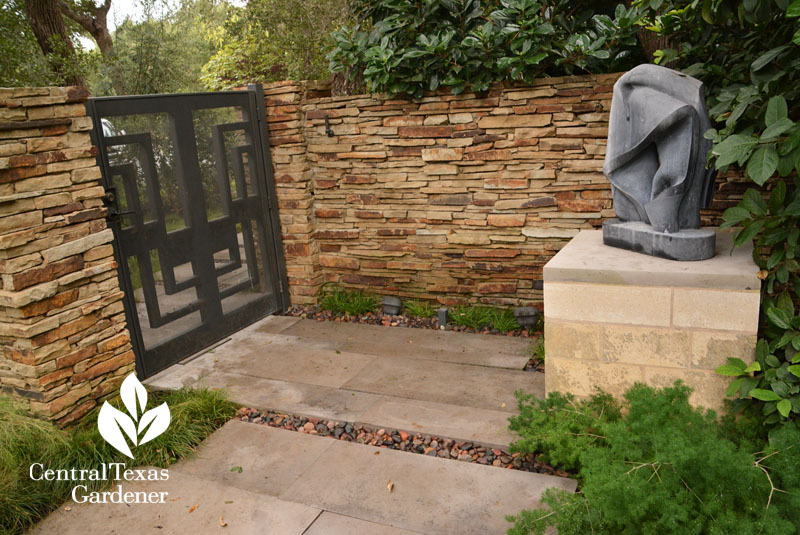 He rendered a classically stylish design against stone walls that mimic rough field stone versions that inspired Pat and David on their travels. His series of Leuder pavers contribute dimension to navigational purpose. 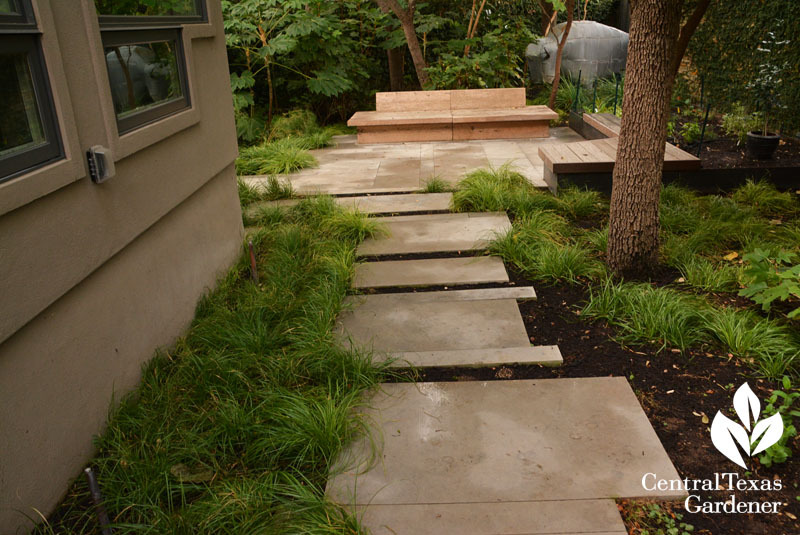 River rocks tucked into the gaps let rainwater permeate the soil. 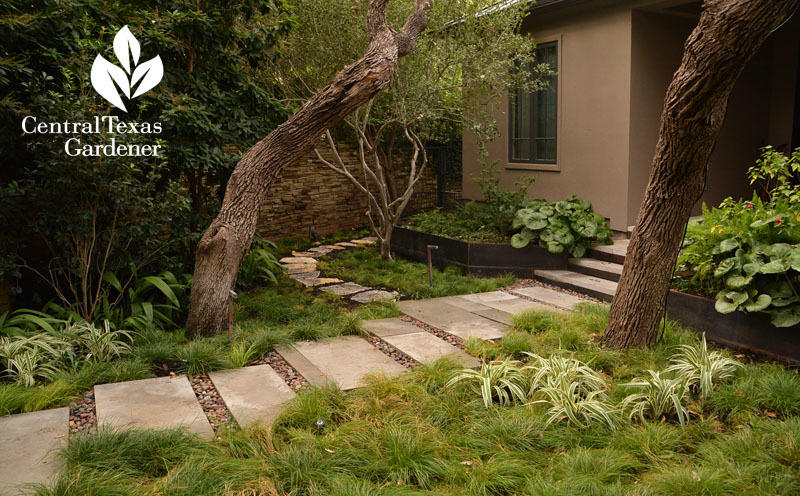 Their new-styled lawn is low-care Berkeley sedge, offset by multiple mostly evergreen textures and foliar colors that work in dappled sunlight. 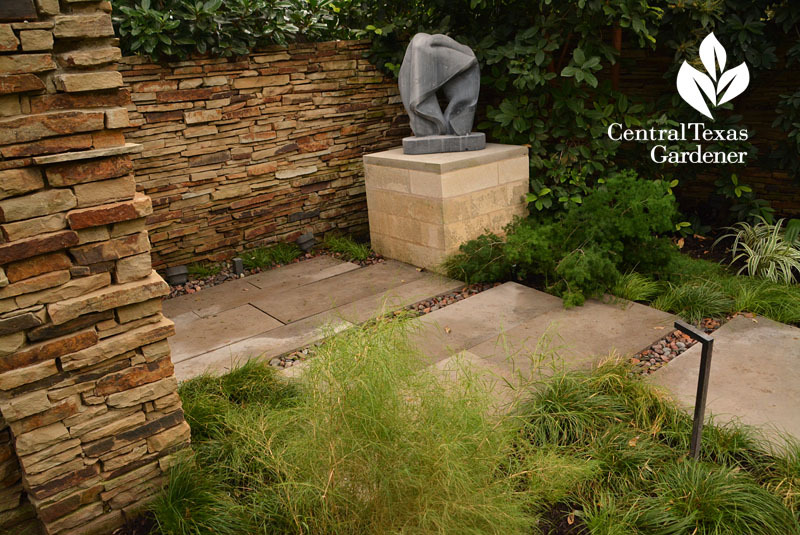 In back, where Pat and David often entertain with their gregarious Cavalier spaniels, Mark framed patio walls with evergreen shrubs and structural small trees. 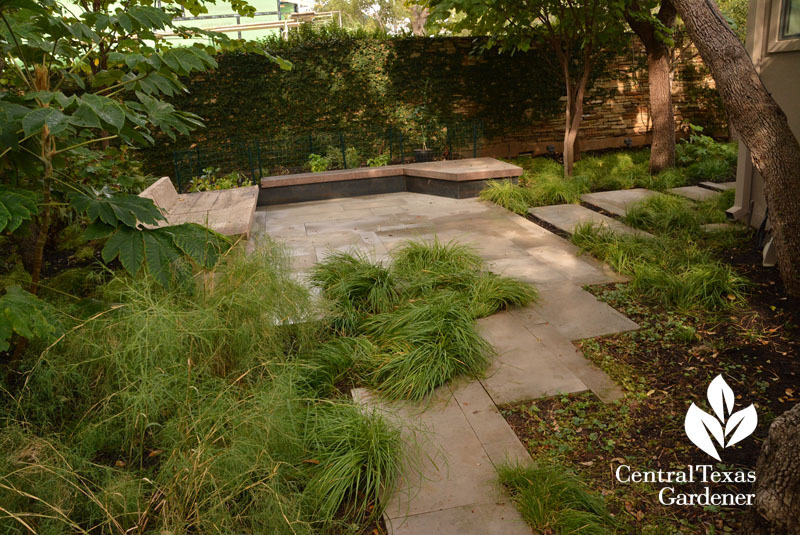 Evergreen sedges pepper the borders. 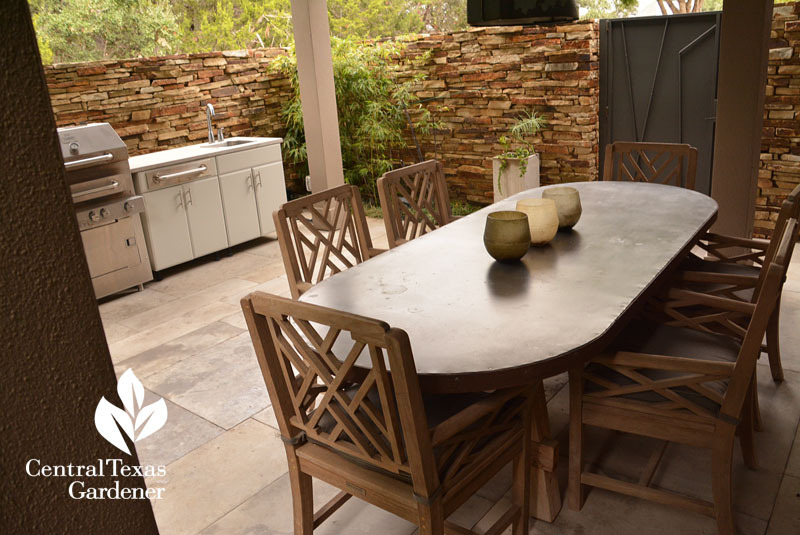 The split level design magnifies space, leading to the outdoor kitchen and dining room, where guests can wander between the upstairs room and the one downstairs. 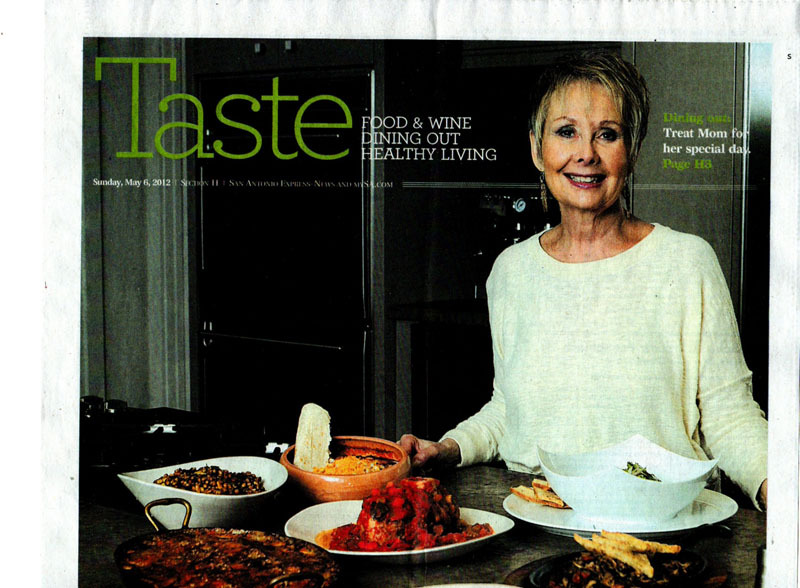 Entertaining is important to Pat, who for 22 years wrote the popular San Antonio News-Express column, Chef’s Secrets. Son Joel Mozersky, an innovative interior designer, found a zinc-topped table and old factory lamp for Pat’s ultimate at home secret: creating harmony on your plate and where it’s set.